If you only have a passing familiarity with the US civil war you might not know that it wasn't just a land-based battle. One lesser known aspect, investigated in this graphic novel, is the attempt by the North to use a naval blockade to stop the South from exporting their cotton. To break the blockade the South built a ship with an iron hull, a hull so strong that cannon balls would bounce off of it. When the Merrimack was put out to sea it was every bit as devastating as it's creators had hoped, and was hampered only by an underpowered engine. The North had heard rumors about the Merrimack long before she was completed and had gotten to work on their own ironclad ship. So not too long after the Merrimack set sail, the North's response, the Monitor was completed. This is a fascinating tale, with the whole civil war as a backdrop. While the information is well researched, the book itself is drawn in a very comical style, with one character, Gustavus Fox, actually presented as a uniform wearing fox. So this is great for someone trying to get a good overview of events – at 128 pages it has the size to give us much more than a glimpse – but it wouldn't be the sort of book that would be cited in the bibliography of any paper. So, entertaining and educational. A great book for 12 and up. The only cautions I can add is that on occasion "swear symbols" are made use of, and in other books in this series (but not this one) God's name is taken in vain. 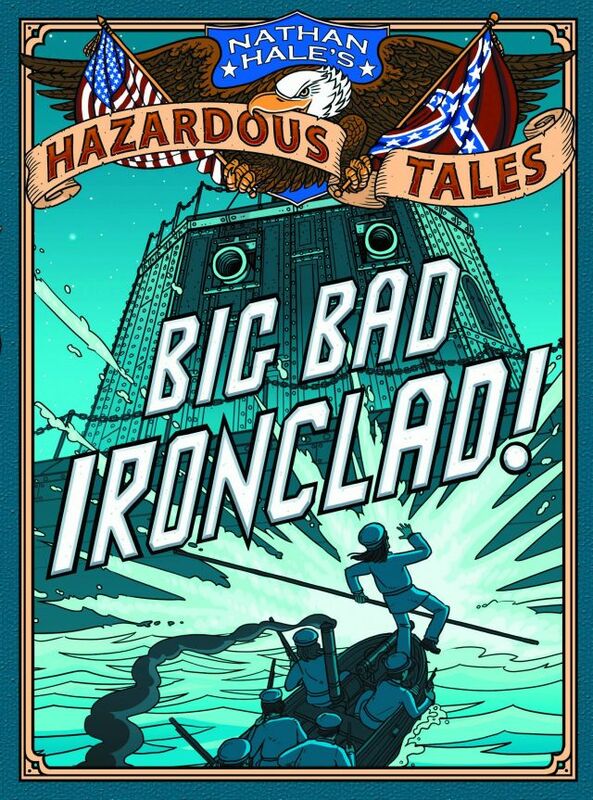 For reviews of the other "Nathan Hale's Hazardous Tales" click here. 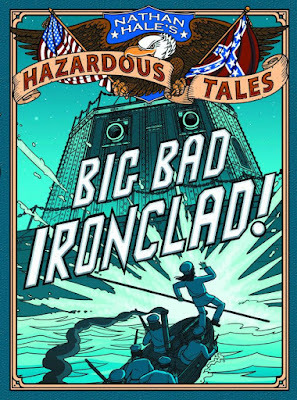 You can purchase Big Bad Ironclad at Amazon.com by clicking here.